Thousands of protesters took to the streets of Morocco on Sunday to push for democratic reforms despite the approval of a new constitution that curbs the near absolute powers of King Mohammed VI. The February 20 Movement, which has organised weeks of demonstrations calling for reforms in the Arab world’s oldest reigning monarchy, has denounced the new constitution as window-dressing and says its approval in Friday’s referendum, where it passed with 98 percent support, was a sham. More than 5,000 protesters rallied in Morocco’s main economic hub Casablanca, chanting “For Dignity and Freedom!”, an AFP reporter at the scene said. “I am here to protest against a constitution that changes nothing and reinforces even more the powers of the king,” said one demonstrator, who gave his name only as Omar. Many of the pro-reform protesters were from the Justice and Charity group, an Islamist organisation that is officially banned but tolerated by the authorities. 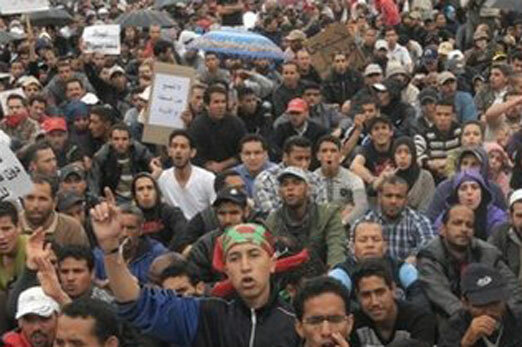 In the capital Rabat, about 1,000 protesters marched through the centre of the city, chanting “Dignity! Liberty! Social Justice!” and “Listen to the voice of the people”. Security forces were present at both marches but did not intervene. “This constitution does nothing to change Morocco. What we want is a new form of government, the end of corruption and a new economic system,” Omar Radi of the February 20 Movement told AFP. He said the new constitution would not placate protesters and that he expected more would now take to the streets in anger over the authorities’ unwillingness to pursue genuine reforms. “We need to keep pressure from the streets and I think many people will join us after this charade of a referendum,” Radi said. Mohammed VI offered the reforms last month following weeks of protests modelled on the Arab Spring uprisings that ousted long-serving leaders in Tunisia and Egypt and have shaken much of the region. Under the new constitution, the king will remain head of state, the military, and the Islamic faith in Morocco, but the prime minister, chosen from the largest party elected to parliament, will take over as the head of government. Officials say the new constitution is the first step in a process of democratic reform and that protesters should work with authorities to change the country. “I would have preferred that these people, who say they are democrats, draw conclusions from the sovereign choice made by the Moroccan people,” Communications Minister Khalid Naciri, a spokesman for the government, told AFP. “They have a duty to adjust their demands to the new reality… and make a positive contribution to the common creation of a new Morocco. Protesting in the streets should not be an end to itself,” he said. A security source told AFP the authorities would not interfere with the demonstrations as long as protesters acted within the law. Up to now authorities have been relatively tolerant of demonstrations and Radi said any attempt to crack down would backfire. “If they try to prevent this they will only add fuel to the fire,” he said. Western leaders have hailed Friday’s vote and the new constitution, while pressing the king to pursue further reforms. Analysts say it is likely the authorities will continue to tolerate the protests, which have been peaceful and have not urged the overthrow of the king, who is widely revered. “If the February 20 Movement now plays the role of a ‘monitor’ by demanding reforms linked with the implementation of the constitution, like the fight against corruption, I think this is something the authorities need,” said Mohamed Tozy, a political science professor at Casablanca’s Hassan II University. “But if it moves toward provocation, there risks being a more forceful response from the authorities,” he said.